Highland Park is the most northern distillery in the UK and is increasing in popularity since a recent re-branding and has now overtaken Lagavulin for sales. The Einar whisky is named after a viking and former ruler of Orkney, its flavours are supposed to mirror those of the fierce and relentless norseman. The nose is driven by smoke and spice, with cinnamon, orange peel becoming apparent in the middle and then caramel starting to come through towards the tail. The nose is very quite different to most peated whiskies in it's sweetness, without the medicinal qualities. 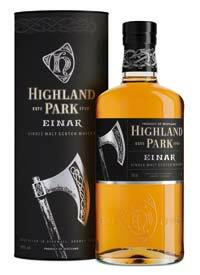 On the palate it is apparent the Einar most have had a smoky temprament with smoke absolutley dominating. Some citrus peel does develop however, along with burnt popcorn and caramel notes that come out on the finish.